Ford Nashett and Irene Black – storytellers who specialize in crime fiction and the paranormal – combined their last names to write under the nom de plume Nash Black. Their titles include novels of intricate detective work involving murder with unexpected results and tales of the paranormal. Their writing has a unifying background in rural America, where long established values demand the characters solve their own problems. A collection of ghost stories, Haints and a non-fiction work, Writing as a Small Business reached the finals of the Independent Publishers Award. Irene and Ford began their writing experience when Irene had an essay printed in an anthology in 1954 and Ford wrote his first play in 1959. They published their first collection of ghost stories, Haints as professional writers in 2008 and achieved Indie Award finalist status. Today, this title is included in the series of short stories, Specter Tales. 2017 – Nash Black added a new character, Evan Blade to the world of professional private detectives with our series Capital Crimes. 2013 – Nash Black created a location for their murder mysteries with the publication of the first of the Ono County series. The inhabitants of Ono County live and work in rural America. Their beliefs and values are their own. Murder is a crime against the community and everyone is glad to provide the sheriff a helping hand. 2011 – Nash Black brought nine Brothers to the annuals of crime fiction. The Young brothers are a modern family who live by an ancient feudal code. They established IF Publishing Company in 1988 for crafting day diaries. In one respect they’ve grown up as independent publishers along with the internet. 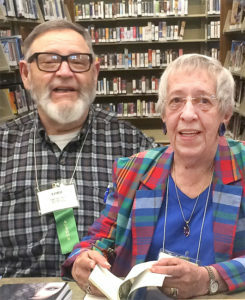 Prior to retiring from public life to follow long-held dreams of recording and publishing their stories, they owned and operated River Cliff Farms during the period from 1965 to 1993. The farms were located outside of Frankfort, KY. When the farms sold, they retained the registered name for use in their novels. As writers we read the work of other writers. When we enjoy a book we share our views as reviews on Amazon.com. On a personal level, they enjoy fishing, boating, live theater and photography. 2016 was a banner year for the duo when their photography club used Nash Black for their annual Earth Day photography contest awards.